While I try to keep my postings upbeat and optimistic, for the sake of full disclosure, I must confess that I am in the midst of a fibro flare-up. Some people call it crashing but to me, crashing is sleeping for hours or days on end and I don’t sleep well. It’s just another symptom. A flare-up is a sharp increase in pain in certain places. When I was younger, pain would migrate – one day my hips, another my neck, ankle, or wrist. But for several weeks, the pain settled in my knees and hips and hasn’t moved. Perhaps it’s a sign of age. I continued with my daily routine – walking the dogs every morning, working, napping, getting on the stationary bike and Les Holden‘s dvd that combines yoga and qi gong. The dvd has 7 and 15 minute routines for morning and evening. Usually, the routines do a good job of stretching critical areas and encouraging the flow of energy. Nothing – not even medication has offered relief from my pain. I felt frustrated, in denial, and found myself becoming more impatient over little things. I was acting without thought and responding to things that I found wrong without checking my language or caring if I was offensive. But I didn’t make the connection that I was have a flare-up. I had a scheduled follow-up appointment with my GP today, a gem of a man who has a good understanding of fibromyalgia and chronic fatigue syndrome. Even though we live in rural Texas, my husband and I were so fortunate to find a young, bright, doctor who studied rural medicine. Perhaps because of the diversity of people whom he treats, Dr. K stays up to date on information and research on chronic fatigue syndrome and fibromyalgia. He told me that he and another physician in the practice have number of patients who suffer from one or both illnesses. The other great thing about Dr. K is that he listens when he asks what’s going on, he listens. He answers questions that I have collected since my last visit, and explains different medications. We discuss options, side effects, and interactions but in the end, I make the decisions. One of my concerns is that I am moving towards rheumatoid arthritis. My tests are sometimes above the normal range and sometimes normal. Dr. K suggested that while some fibromyalgia patients also contract RA, the RA Factor test alone does not give a definitive answer. Other tests need to show abnormalities and so far, all of my other tests have been ok. I visited the vampires and donated some of my blood once again to see if there were any changes. After talking about different treatment possibilities, we decided to make only one change to Soma, an anti-inflammatory. Why take these prescription medications some may ask. It’s not that I am a fan of pharmaceuticals but for me, the alternative of feeling lousy and having severe pain is unacceptable. Last year, I had weekly acupuncture treatments with an excellent acupuncturist but after 8 months, we both agreed that the acupuncture wasn’t working. I have had acupuncture before from different practitioners over the years, and this one is by far the best. Treatments, like acupuncture, no longer work for me . I am not familiar with all alternative therapies but I do know many and have tried some at one time or another. But I will only try treatments that cannot do further harm or preach of being a ‘miracle cure.’ There is no such thing despite claims to the contrary by sly marketers. When I accept that my body is having a flare-up, or the doctor tells me, I try to slow down. I may not get on the bike as much but I will still walk the dogs daily. It is one of my most joyful times of the day. Watching my 3 labs run, play, chase and wrestle makes me smile regardless of how I feel. I have learned acceptance to the fact that I have a chronic illness but cannot accept the fact that it will manage my life. I have a project to complete so I can earn my M.Ed. in May, a new business that I am so passionate about that I live and breathe – my desire to help others with chronic illness. I suffered from chronic illness for many years before diagnosis which was 12 years ago. I’ve been through it all, going from the bed to the job to the sofa to the bed. But through this long process, I began learning how to manage my life on my terms. Even if difficult and accommodations are necessary, I was going to do what I want. It has been a long and arduous process because I had to figure it out alone. When first told that I had overlapping chronic illnesses that nobody knows anything about, I was determined to learn and try almost anything to get better. But over the years, I figured things out, began understanding my body better, and learned how to manage my life in a way that works for me. Traveling is now tough for me and as a result, I no longer have the yearning to see many foreign lands like I once did. Even going to visit my husband’s mother – a 2 1/2 hour drive – can be difficult but I want to see her and the family. I was relieved how accepting and understanding that I need to rest more than ‘normal’ people. I also plan on taking it easy for a few days when I return home. I always want to celebrate Thanksgiving with my mom and siblings so I happily travel wherever she decides to spend that holiday. And there is nothing that will keep me from my niece’s wedding in June. Crazy as it sounds, my husband and I are considering a two-week vacation with our travel trailer to visit one of my childhood friends who is now building a ranch in Eastern Washington with her husband. There are states I haven’t visited, National Parks I haven’t seen, and there is no way that I would turn down an opportunity to spend time with my dear friend and her wonderful hubby. When it comes to things I want to do, I plan accordingly. I don’t worry about consequences when I get home. The memories will be so worth it! Tomorrow, my husband wants to take me out to dinner and a movie for Valentine’s Day. I look forward to dates with him despite my flare-up. It will still be fun. Yeah, I’m bummed that I hurt and have less energy than usual (energy is relative anyway). I try to pay better attention to my physical needs, adjust to the new medication and hope it will ease the pain without unbearable side effects. If soma doesn’t work, I’ll try something else. It’s not that I am an optimist so much as I am stubborn. And I strongly believe that anyone with chronic illness can live a fuller and more joyous life. Dr. K. told me that I am the only one of his patients with a chronic illness who keeps on going. Each of us needs to manage our own life. As a coach, I don’t push my life on my clients. 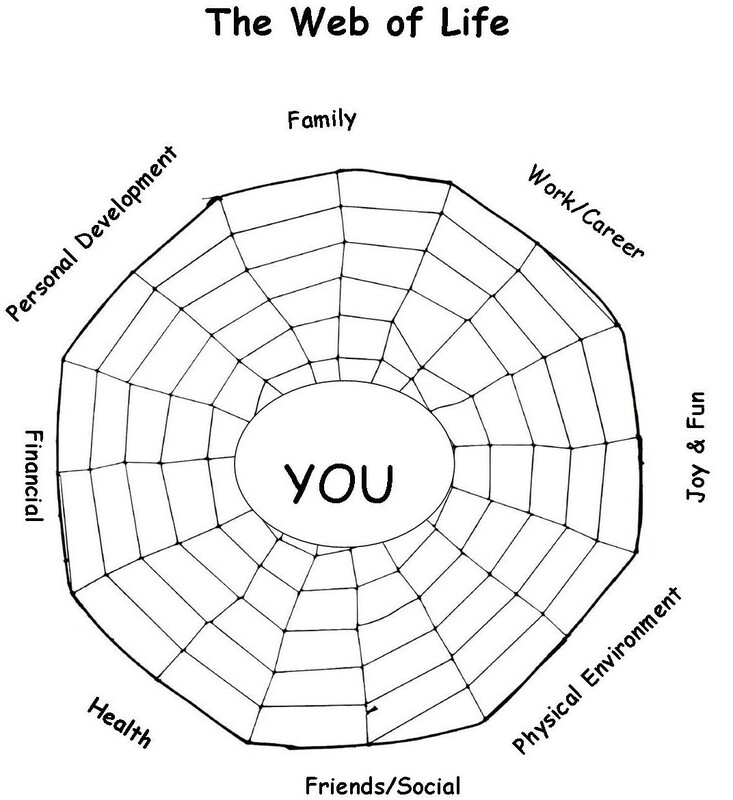 I encourage my clients to consider how they feel about the different aspects of their web of life – below. My clients set the priorities – which may change from session to session. My goal is for all of my clients to achieve their dreams and live the life they want despite chronic illness and pain. I don’t want people with chronic illness to let their pain control their life. Sure, this wasn’t the life expected growing up. But that doesn’t mean life has to stop. Those of us who are chronically ill can let the pain lead our lives or live the way we want despite the pain. I choose the latter. Time to cover the budding and blossoming hyacinth as we may have a frost tonight then make my favorite southern comfort food – chicken fried steak. I know, it may not be healthy but ooh it’s delicious.